Bionomic Industries, Inc., a leading manufacturer of cutting-edge scrubber systems technology, has announced successful startup of an advanced fluidized slurry sulfur dioxide (SO2) gas scrubber at a facility in Western Pennsylvania. The compact, highly efficient scrubber utilizes Bionomics' patented RotaBed® technology to harness the movement of the flue gas to provide both mixing and gas cleaning - instead of using the power wasting spray nozzles found in older scrubbers to distribute the limestone. 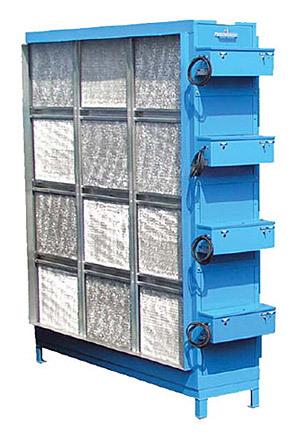 The scrubbers unique design places more of the limestone in effective contact with the flue gas, allows higher density slurry recycling than other technologies, and serves to reduce scaling. A slow rotation is imparted to the limestone/flue gas mixture to stabilize the slurry in the scrubber and the operation functions at more than twice the gas speed of spray-type devices. Bionomic Industries provided the scrubber and all ancillary equipment including the systems specially designed forced oxidation sump. This agitated, dual compartment sump mixes and retains the scrubbing slurry and produces calcium sulfate (gypsum) as a by-product. Rubber lined centrifugal pumps pull the slurry from the sump and recycle it to the low pressure (under 5 psig) headers mounted in the scrubber. The system fully meets all Pennsylvania and Federal emissions codes, is available in shop-built units up to 110,000 acfm, and is ideally suited for small to moderate size SO2 control projects. Field erected units are also available for larger gas volume applications. For more information, call 201-529-1094, e-mail: sales@bionomicind.com, or visit www.bionomicind.com.